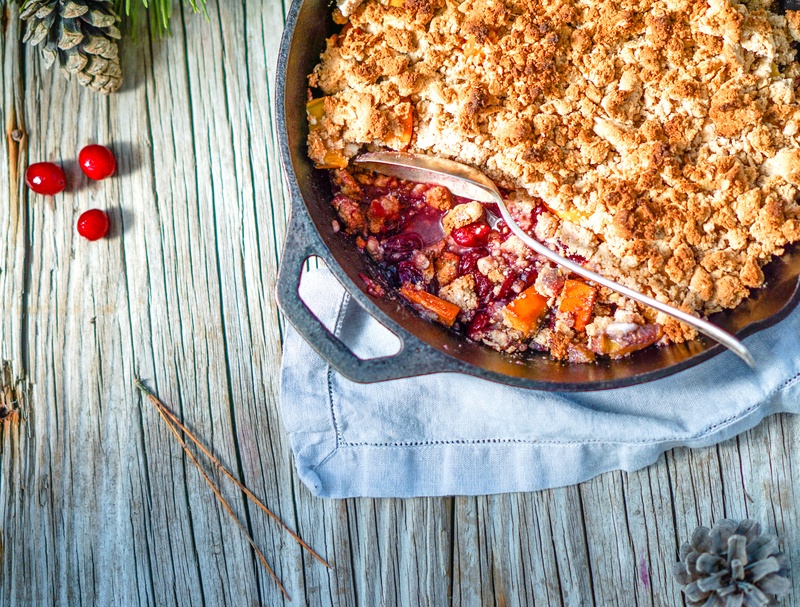 Do you find yourself defaulting to the same types of desserts every holiday season? This winter, spice up your dessert routine with this recipe for a persimmon crumble with orange-vanilla cream from HHS Chef Eric Pierce. This take on a classic apple crumble gets a new twist with persimmons, an Asian fruit that resembles a tomato in appearance but is incredibly sweet. The added flair of homemade whipped cream really brings it all together to create a delicious dish your holiday guests will be raving about. Place a medium mixing bowl in the freezer to cool for at least 30 minutes. Preheat the oven to 350°F. In a greased casserole dish, start to mix the filling of the pie by tossing the persimmons with the spices, ginger, sugar, flour, and vanilla. Spread into an even layer. Then prepare the crumble topping. In a medium bowl, add all ingredients for the crumble and start cutting with a large fork until the mix starts to come together. Use your hands to finish working it together until it is completely incorporated and crumbles start to form. Spread the crumble mixture evenly on top of the persimmon mix, and bake for 45 minutes until the top is golden brown. Once cooked, remove from the oven and allow to cool for at least 15 minutes. While the crumble is baking, prepare the whipped cream. Remove the chilled bowl from the freezer and combine the cream, sugar, zest, and vanilla. Using a hand or stand mixer, whip the cream until soft peaks form. Refrigerate or serve immediately on top of the crumble. *Note: Apples can be substituted for persimmons in this recipe. *Additional Note: Turbinado sugar, less processed than brown sugar, is a crystallized form of sugar that is made from the first pressing of sugar cane and retains some natural molasses.